All bookings can be paid in advance online when booking reciept is received. Payment is made online or via our express check-in/out kiosk in the hotel with Visa or MasterCard. Remember to have your customer and booking number ready. 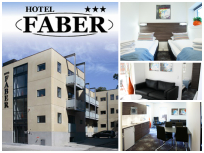 This is only available on the booking reciept received from the Hotel Faber. We do not accept cash payments. Payment can not be made with other types of cards than the above mentioned. There will be a credit card fee depending on card type.